1Also .eu shared with other European Union member states. Lithuania, officially the Republic of Lithuania ( Lithuanian: Lietuva; official — Lietuvos Respublika), is a country in northern Europe. The largest of the three Baltic States situated along the Baltic Sea, it shares borders with Latvia to the north, Belarus to the southeast, Poland and the Russian exclave of the Kaliningrad Oblast to the southwest. Lithuania has been a member state of the European Union since May 1, 2004. Lithuania entered into the annals of European history when it has been first mentioned in a medieval German manuscript, the Quedlinburg Chronicle, on February 14, 1009. 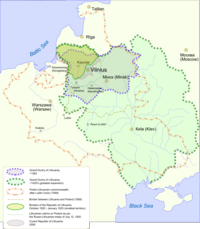 The Lithuanian lands were united by Mindaugas in 1236, and neighboring countries referred to it as "the state of Lithuania". The official coronation of Mindaugas as King of Lithuania, on July 6, 1253, marked its recognition by Christendom, and the official recognition of Lithuanian statehood as the Kingdom of Lithuania. During the early period of the Gediminids (1316-1430), the state occupied the territories of present-day Belarus, Ukraine, and parts of Poland and Russia. By the end of the 14th century, Lithuania was the largest country in Europe. The Grand Duchy of Lithuania stretched across a substantial part of Europe, from the Baltic to the Black Sea. Lithuanian nobility, city dwellers and peasants accepted Christianity in 1385, following Poland's offer of its crown to Jogaila, the Grand Duke of Lithuania. Grand Duke Jogaila was crowned King of Poland on February 2, 1386. Lithuania and Poland were joined into a personal union, as both countries were ruled by the same Jagiellon dynasty. In 1401, the formal union was dissolved as a result of disputes over legal terminology, and Vytautas, the cousin of Jogaila, became the Grand Duke of Lithuania. A royal crown had been bestowed upon Vytautas in 1429 by Sigismund, the Holy Roman Emperor, but Polish magnates prevented the coronation of Vytautas by seizing the crown as it was being brought to him. A new crown was ordered in Germany and a new date set for the coronation, but a month later Vytautas died in an accident. In 1569, Lithuania and Poland formally united into a single dual state called the Polish-Lithuanian Commonwealth. As a member of the Commonwealth, Lithuania retained its sovereignty and its institutions, including a separate army and currency. In 1795, the joint state was dissolved by the third Partition of the Commonwealth, which forfeited its lands to Russia, Prussia and Austria, under duress. Over ninety percent of Lithuania was incorporated into the Russian Empire and the remainder into Prussia. On February 16, 1918, Lithuania re-established its independence. From July, 1918, until November of that year, Monaco-born King Mindaugas II was pronounced the titular monarch of Lithuania, until the country's parliament opted for a republican form of government. From the outset, territorial disputes with Poland (over the Vilnius region and the Suvalkai region) and with Germany (over the Klaipėda region, German: Memelland) preoccupied the foreign policy of the new nation. 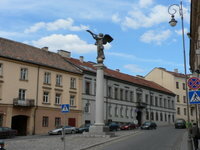 During the interwar period, the constitutional capitol was Vilnius, although the city itself was annexed by Poland from 1920 to 1939 (see History of Vilnius for more details). 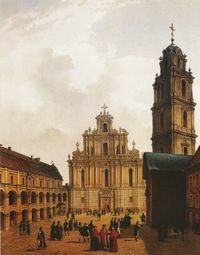 The Lithuanian government at the time was relocated to Kaunas, which officially held the status of temporary capital. In 1940, at the beginning of World War II, the Soviet Union occupied and annexed Lithuania in accordance with the Molotov-Ribbentrop Pact. It later came under German occupation, during which around 190,000 or 91% of the Lithuanian Jews were killed, resulting in one of the worst death rates of the Holocaust. After the retreat of the German army, Lithuania was re-occupied by the Soviet Union in 1944. During the Soviet and Nazi occupations between 1940 and 1954, Lithuania lost over 780,000 residents. An estimated 120,000 to 300,000 of that number were killed or exiled to Siberia by the Soviets, while others chose to emigrate to western countries. On February 4, 1991, Iceland became the first country to recognize Lithuanian independence. Sweden was the first to open an embassy in the country. 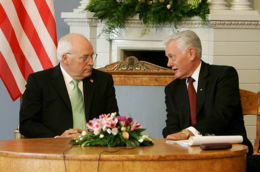 The United States of America never recognized the Soviet claim to Lithuania or to the other two Baltic republics. Lithuania joined the United Nations on September 17, 1991. On May 31, 2001, Lithuania became the 141st member of the World Trade Organization. Since 1988, Lithuania has sought closer ties with the West, and so on January 4, 1994, it became the first of the Baltic States to apply for NATO membership. On March 29, 2004, it became a full and equal NATO member and on May 1, 2004, Lithuania joined the European Union. Since Lithuania declared independence on March 11, 1990, it has kept strong democratic traditions. In the first general elections after the independence on October 25, 1992, 56.75% of the total number of voters supported the new constitution. Drafting the constitution was a long and complicated process. The role of the President fueled the most heated debates. Drawing from the interwar experiences, politicians made many different proposals ranging from strong parliamentarism to the United States' model. Eventually a compromise semi-presidential system was agreed upon. The Lithuanian head of state is the President, elected directly for a five-year term; he or she may serve a maximum of two consecutive terms. The post of President is largely ceremonial with functions of overseeing foreign affairs and national security policy. The President is also the commander-in-chief. The President, with the approval of the parliamentary body, the Seimas, also appoints the prime minister and on the latter's nomination, appoints the rest of the cabinet, as well as a number of other top civil servants and the judges for all courts. The judges of the Constitutional Court (Konstitucinis Teismas), who serve for nine year terms, are appointed by the President (three judges), the Chairman of the Seimas (three judges) and the chairman of the Supreme Court (three judges). The unicameral Lithuanian parliament, the Seimas, has 141 members who are elected to four-year terms. 71 of the members of this legislative body are elected in single constituencies, and the other 70 are elected in a nationwide vote by proportional representation. A party must receive at least 5% of the national vote to be represented in the Seimas. The current administrative division was established in 1994 and modified in 2000 to meet the requirements of the European Union. 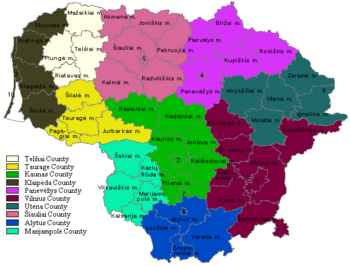 Lithuania now has a three-part administrative division: Lithuania is divided into 10 counties (Lithuanian: singular — apskritis, plural — apskritys) that are further subdivided into 60 municipalities (Lithuanian: singular — savivaldybė, plural — savivaldybės) which consist of over 500 elderates (Lithuanian: singular — seniūnija, plural — seniūnijos). The counties are ruled by county governors (Lithuanian: apskrities viršininkas) who are appointed by the central government. These officials ensure that the municipalities adhere to the laws of Lithuania and the constitution. County government oversees local governments and their implementation of the national laws, programs, and policies. Elderates are the smallest units and they do not play a role in national politics. They were created so that people could receive necessary services close to their homes; for example, in rural areas the elderates register births and deaths. They are most active in the social sector: they identify needy individuals or families and distribute welfare or organize other forms of relief. The current system of administrative division receives frequent criticism for being too bureaucratic and ineffective. Significant complaints are made about the number of counties, since they do not have much power vested in them. 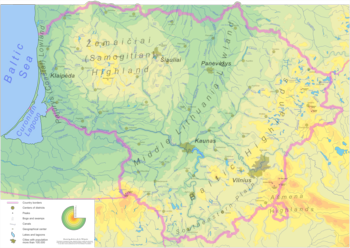 One proposal is to create four lands, a new administrative unit, the boundaries of which would be determined by the ethnographic regions of Lithuania. The benefit would be that the lands would follow natural boundaries, rather than being defined by bureaucrats or politicians. Another of the proposed solutions involves reducing the number of counties so that there would be five in total, each based in one of the five largest cities with populations of over 100,000. Others complain that elderates have no real power and receive too little attention; they could potentially become local initiative communities which could tackle many rural problems. Physical map of Lithuania. Click on the image for better resolution. Lithuania is situated in northern Europe and is the largest and most populous of the Baltic states. It has around 99 kilometres (61.5 mi) of sandy coastline, of which only about 38 kilometres (24 mi) face the open Baltic Sea; the rest of the coast is sheltered by the Curonian sand peninsula. Lithuania's major warm-water port, Klaipėda, lies at the narrow mouth of the Curonian Lagoon (Lithuanian: Kuršių marios), a shallow lagoon extending south to Kaliningrad. The main river, the Neman River, and some of its tributaries carry international shipping vessels. The Lithuanian landscape has been smoothed by glaciers. The highest areas are the moraines in the western uplands and eastern highlands, none of which are taller than 300 metres (1,000 ft) above sea level, with the maximum elevation being Aukštojas Hill at 294 metres (964 feet). The terrain features numerous lakes, Lake Vištytis for example, and wetlands; a mixed forest zone covers 30% of the country. The climate lies between maritime and continental, with wet, moderate winters and summers. According to some geographers, Lithuania's capitol, Vilnius, lies a few kilometres south of the geographical centre of Europe. Lithuania Minor also known as "Prussian Lithuania" — (Lithuanian: Mažoji Lietuva or Prūsų Lietuva). Most of it is currently controlled by Russia ( Kaliningrad Oblast). In 2003, prior to joining the European Union, Lithuania had the highest economic growth rate amongst all candidate and member countries, reaching 8.8% in the third quarter. In 2004 -7.3%; 2005 - 7.6%; 2006 second quarter - 8.4% growth in GDP reflected impressive economic development. Most of the trade Lithuania conducts is within the European Union. It is a member of the World Trade Organization, and the European Union. 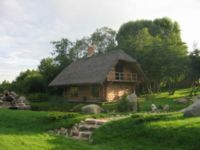 By UN classification, Lithuania is a country with a high average income. The country boasts a well developed modern infrastructure of railways, airports and four lane highways. It has almost full employment, with an unemployment rate of only 2.9%. According to officially published figures, EU membership fueled a booming economy, increased outsourcing into the country, and boosted the tourism sector. The litas, the national currency, has been pegged to the Euro since February 2, 2002 at the rate of EUR 1.00 = LTL 3.4528, and Lithuania is expected to switch to the Euro on 1 January 2009. Like other countries in the region (Estonia, Latvia) Lithuania also has a flat tax rate rather than a progressive scheme. Lithuanian income levels still lag behind the rest of the older EU members, with per capita GDP in 2006 at 56% of the EU average. Lower wages may have been a factor that in 2004 influenced the trend of emigration to wealthiest EU countries, something that has been made legally possible as a result of accession to the European Union. In 2006 income tax was reduced to 27% and a further reduction to 24% is expected in October of 2007. Income tax reduction and 14% annual wage growth is starting to make an impact with some emigrants gradually beginning to come back. The latest official data show emigration in early 2006 to be 30% lower than the previous year, with 3,483 people leaving in four months. 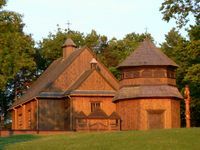 The oldest wooden church is located in Palūšė. Lithuania has strong Catholic traditions. 83.5% of the Lithuanian population are ethnic Lithuanians who speak the Lithuanian language (one of the two surviving members of the Baltic language group), which is the official language of the state. Several sizable minorities exist, such as Poles (6.7%), Russians (6.3%), and Belarusians (1.2%). Because of Soviet occupation, most Lithuanians can communicate in Russian. According to the Eurostat poll about 80% of the Lithuanians can hold a conversation in Russian and almost all are familiar with the most general phrases and expressions. Nowadays, most Lithuanian schools teach English as a first foreign language, but students may also study German, or, in some schools, French. Schools where Russian and Polish are the primary languages of education exist in the areas populated by these minorities. The historically predominant religion is Roman Catholicism. The Roman Catholic Church has been the majority confession since the Christianization of Lithuania in the 14th century. No less than 79% of Lithuanians are Roman Catholic. The Roman Catholic Church used to be an influential factor in the country, and some priests actively led the resistance against the Communist regime and, after independence was regained, against socialism and liberalism, especially in ethical questions. The nationally renowned anti-communist resistance shrine, the Hill of Crosses, upon which thousands of Latin rite crosses of all sizes have been placed, is located near the city of Šiauliai. During the late 1800s, the erecting of Latin crosses upon the mentioned hill was forbidden by the Czarist Russian Orthodox authorities. During the 20th century, the Soviet authorities also forbade such explicit religious symbols. The crosses were removed in 1961, with tractors and bulldozers, but despite Soviet prohibitions, Lithuanian Roman Catholics continued to put small crucifixes and larger crosses on this Hill of the Crosses. Pope John Paul II visited the hill during his visit to Lithuania, primarily because it was a sign of anti-Communist Catholic resistance, as well as a Roman Catholic religious site. Lithuania was the only majority-Catholic former Soviet republic. The diverse Protestant community (1.9% of the total population) is much smaller than the Roman Catholic Church; Protestants are scattered all over the northern and western parts of Lithuania. Lithuania was historically positioned in between the two German-controlled states of Livonia to the north and the Protestant formerly monastic, Teutonic State of Prussia to its south. In the 16th century, from those two regions Lutheran Protestantism started to spread into the country. Since 1945 Lutheranism in the country has declined. Various Protestant churches have established missions in Lithuania since 1990, including the United Methodists, the Baptist Union, the Mennonites, and World Venture. The country also has minority communities of Eastern Orthodoxy (mainly among the Russian minority), to which about 4.9% of the total population belongs, as well as of Judaism, Islam, and Karaism (an ancient offshoot of Judaism represented by a long-standing community in Trakai), which together make up another 1.6% of the population.